Witness reveals she saw WoW smuggle scroll in violation of regulations hidden in a bag, reports police threateningly indifferent. A resident of the Jewish Quarter of Jerusalem's Old City, who asked to be identified only as S., told Arutz Sheva how on Monday morning she witnessed firsthand the way in which members of the radical Women of the Wall (WoW) organization smuggle Torah scrolls into the women's section of the Western Wall Plaza in breach of the site's guidelines. While WoW generally reserves their provocative prayers at the Kotel (Western Wall) for the Jewish new month festival of Rosh Chodesh, on Monday they arrived even though it was a regular weekday. Orthodox Judaism limits Torah scrolls to the men's section of a synagogue given that the time-bound obligation to read from the Torah is incumbent upon them and not women, and consequently women recite the blessing in vain when reading the Torah aloud publicly. S. reported that many observant Jewish women avoid the women's section of the Kotel on Rosh Chodesh so as not to be caught up in the provocative actions of WoW, which continues to insist on praying at the site in breach of the Kotel regulations despite the fact that an egalitarian section has been especially established for them adjacent to the site. She emphasized that as long as WoW members pray quietly or even "dress up like men" wearing the male prayer garb of talit, tefilin and kippot in opposition to Jewish tradition, she has no problems with them. But when they break into loud vocal singing and disrupt the men's section, violating Jewish customs of not having women sing publicly, S. noted it disturbed her greatly and therefore she prefers on Rosh Chodesh to pray at home instead, where she is able to focus on her prayers. On Monday morning she described how she saw a WoW group wearing tefilin and talit. "I have no problem with that, but then they took out a Torah scroll and read from the Torah," she reported. "It really disturbed me because I felt they covertly brought the Torah scroll in to the Kotel Plaza." She continued, noting how "they read from the Torah scroll and immediately afterwards the Torah scroll was really quickly hidden inside blankets and put inside a large bag." "On site there are many police officers and when I told one of them, she told me 'get out of here fast. You're disturbing here,'" S. said, claiming a threatening indifference on the part of the police. "I told her that there's a Torah scroll here that they brought in secretly and without permission, inside blankets and a large bag and then they continued praying." 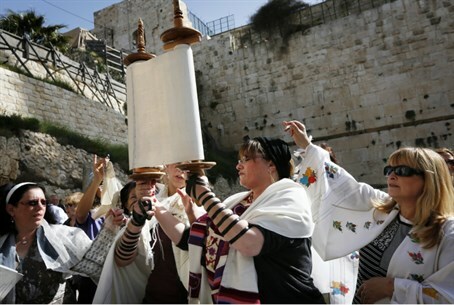 Back in January 2014 the WoW denied to Arutz Sheva that they tried to smuggle a Torah scroll into the Kotel plaza, even while acknowledging reports that they stored a scroll inside a bag; last October the group publicly posted pictures with a miniature Torah scroll they had smuggled in.